Read an excerpt and an interview. Was Brasillach in fact guilty of treason? Was he condemned for his denunciations of the resistance, or singled out as a suspected homosexual? Was it right that he was executed when others, who were directly responsible for the murder of thousands, were set free? 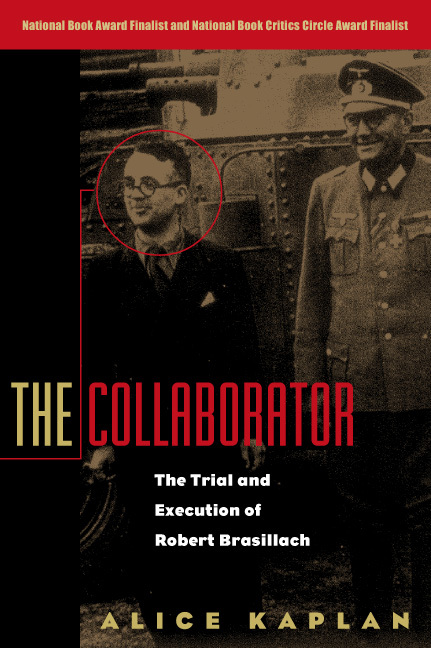 Kaplan’s meticulous reconstruction of Brasillach’s life and trial skirts none of these ethical subtleties: a detective story, a cautionary tale, and a meditation on the disturbing workings of justice and memory, The Collaborator will stand as the definitive account of Brasillach’s crime and punishment.